There are probably hundreds and thousands of companies that make wallets and purses for people, but Cuir Ally has done something special just for technology and gadget lovers. Smartphones are everywhere, and it’s time we upgrade our wallets to a smart wallet, which can be tracked or found online, it can be synced with your smartphone (iOS, Android) and it can even take selfies. What more can you ask from this genius gadget called the Voyager Smart Wallet. Until now, in every few months, my father forgets his wallet at some place and then we have to do some exercise to find it. This exercise is not easy, and the consequences can be severe. What happens when you lose your wallet? Many people in real life forget about their belongings, and I am one of them. Also, I am sure you must have been through this situation. When it comes to leaving your purse and wallets at a place, you can only pray that you get everything back. Many important things in your wallet can’t be ignored, some of them are. Cash / Photos / Sim Cards etc. Once you lose your card money and licenses, you have to get them back, report their misplace status, and hence it will cost you money and time to get them back. Not only that, but there is also the pain of reporting, telling people about missing documents, rushing to government officers. All of this becomes extremely inconvenient. 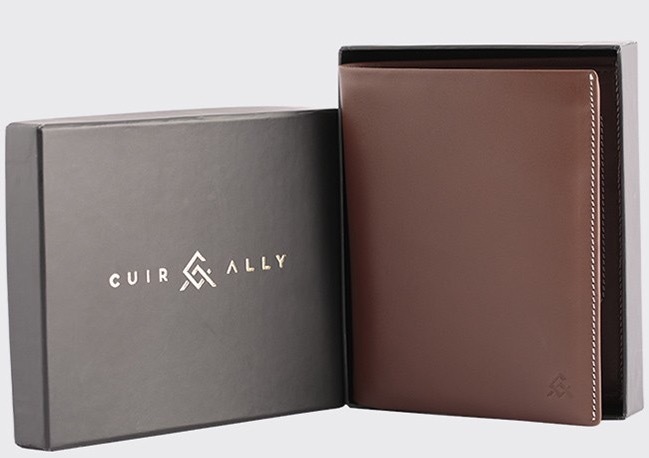 As soon as I came to know about smart wallets, I searched online and found Cuir Ally, a company that makes smart wallets that can be tracked with your phones and vice versa. Yes, you can even track your phone if it gets misplaced. I have been using it from past seven days, and I am in love with it. It’s smart, elegant and highly sophisticated. Just see this video below, you will get an idea what I am talking about. You get a notification on your smartphone (iOS or Android) when Voyager is out of range. You can see the last location of the Voyager through a laptop, tablet or computer. The vice-versa which means you can find your Voyager with your smartphone. And finally you can your Voyager as a selfie remote, just open camera app and press the Voyager to click a photo from your smartphone. Voyager smart is made up of a fine-grain premium leather that has space for a pen, a handy booklet for taking notes, a hidden sim card and sim tool slot, two hidden rear card slots for your visiting cards, a hidden secure slot for your ID Card, ergonomic and secure passport sleeve and a Smart Chip which is embedded inside. The design of Voyager is unique and also patented. It also fit a lot more with a lot less. Thus it maintains a slim look and profile, which means bye bye to traditional fat-bulging wallets. The size of Voyager is dimensioned at 13.9cm x 11 x 1.5 cm. No need to charge your smart wallet and the company has designed it to run a full year with zero upkeep. No battery replacement, no charging required. After 12 months, use Chipolo Renewal Program and it has discounts plus benefits inside. Priced at Rs 3,499 this Wallet comes with 1 Year Warranty, Patent Protected Design, and three different colors – Blue, Brown, and Black. This smart wallet is really going to be the next thing in the market, not only does it look good, but they are functional, they make your life easier, and that’s why they are called smart. So, take my advice and bring a new wallet for yourself or gift them to your parents, they will love it for sure.